I had just graduated, attending both the Nicholas School of the Environment ceremony as well as the big Duke ceremony at the Durham Bulls stadium. It was time to celebrate! As an avid birder, there was no celebration better than heading off with my family to the Outer Banks for two days of searching for migratory birds. There was only one problem: it was raining. We all endured brief showers during the Duke commencement ceremony, but an early tropical storm ensured that we would experience a driving rain as we approached coastal North Carolina. Now, I’m an environmental student. I don’t mind a little bit of rain, and I’m even okay with getting wet. However, I had yet to really bird in a rainstorm. Birds tend to seek dry, sheltered places during inclement conditions, making them more difficult to spot. I have been fortunate enough during my birding travels to rarely encounter rain, and when it’s stormy in Durham I simply do other things. But I only had two days on the coast, and I wasn’t going to waste a minute of it. First stop on our trip was the Alligator River Wildlife Refuge, located on the Abermarle-Pamlico Peninsula. 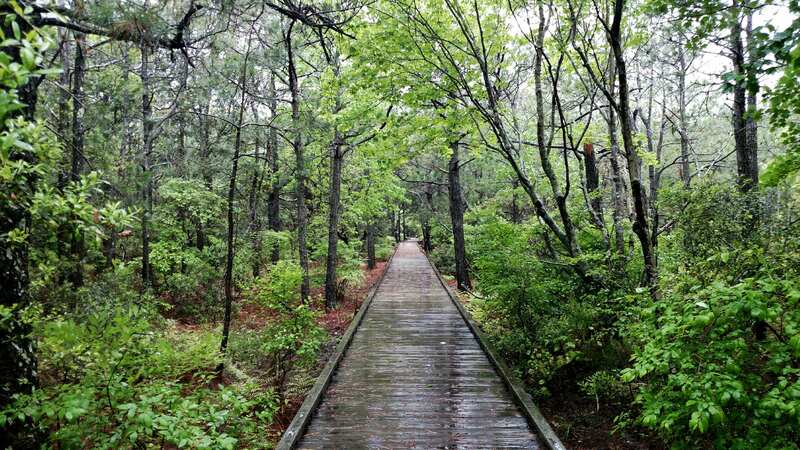 My father and fiance wanted to try fishing off a small boardwalk, so my mother and I headed down the path, our cameras and binoculars tucked safely inside our raincoats. Luckily it was warm, but soon water was streaming down our legs and coating any exposed skin or hair. Still we trudged on, though we could hear little besides the pitter-patter of raindrops and gusts of wind. But then, suddenly, a loud tweet call rang out across the trail. It was close, really close, and we both craned our necks to the canopy above to try to pick out the bird. After a few seconds my mom zeroed in, and as I spotted the little bird in my binoculars I let out a short gasp: we were face to face with a Prothonotary Warbler, a life bird for me! Prothonotary Warblers are a brilliant yellow, with gray wings and a greenish back. They are breathtakingly beautiful, and in the spring and summer live in the wooded swamps of the Southeast – the exact habitat adjacent to our trail within the Alligator River Wildlife Refuge. The warbler did not seem bothered by the wet weather, and stayed in full view for a few minutes before flitting away deeper into the woods. My first bird of the trip, and a bird I had never seen before! We left Alligator River and continued to the Outer Banks, spending a few more wet hours in Corolla, north of Nag’s Head. 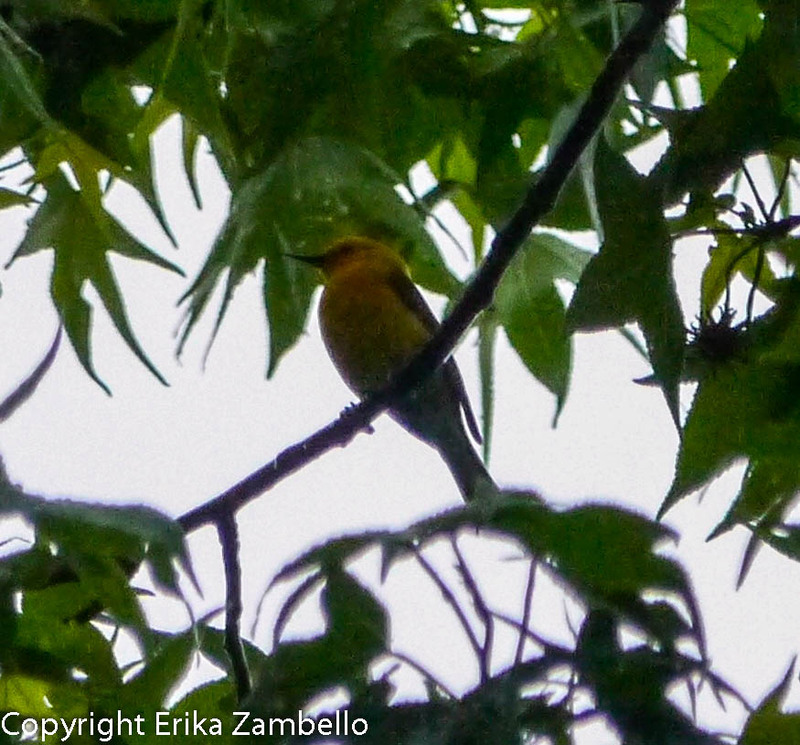 Though we saw Great Egrets and Ospreys and a Great-crested Flycatcher, the Prothonotary Warbler was the highlight of my day. The sun came out and we had beautiful weather during the second day of our trip, but the Prothonotary Warbler remained my favorite.